Note: once again we have a number of photography sites blindly repeating numbers they found published by the mainstream press, this time the decline in camera unit volume at Sony reported in their latest financial disclosures (unit volume down 27%). Without a detailed breakout, it’s tough to tell what that decline really represents, but I’d guess it’s mostly Cyber-shots, which are slowly becoming invisible. Just to be clear, CIPA is reporting that overall compact camera unit volume is down 21% year-to-year, while DSLRs are down 5% and mirrorless up 3%. I don’t see Sony’s position any different than Canon’s, Nikon’s, or any other Japanese camera company: the low-end compact camera is dying. All the companies are trying to stabilize by living off more expensive cameras in lower volumes. I’d say the jury is out on whether that will work long-term or not. 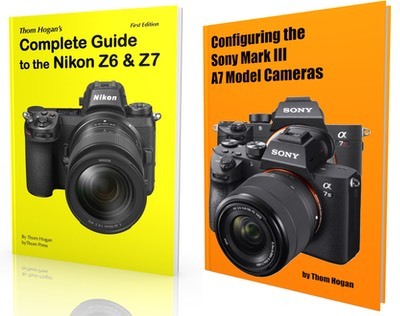 I don’t see customers upgrading their expensive cameras nearly as often as inexpensive ones, for example, so such a strategy will only work for a short time before we see another clear down-turn in unit volumes. Note: a number of photography sites are blindly repeating Reuters’ “…Canon profits down 21%...” claim, some even (incorrectly) attributing that to mirrorless cameras. Yes, you can find a -21% number in Canon’s reports: it is the year-to-date profit number versus last year for the entire company, not a quarterly decline in camera operations. Year to year, the results Canon just reported show third quarter camera unit volume down 7.6% and overall camera profits down 3.8%. Canon’s projections for the full year are a 10% decline in unit volume and 3.1% decline in profits for the camera group. Yes, Canon is under stress in the camera group. A far more troubling number than the other financial values in their report was the 16% increase in inventory in the camera group, which implies that Canon has been overproducing to demand. All that said, Canon still projects to sell far more DSLRs this year than the entire mirrorless camera market combined. Fujifilm Adds a Lens, Teleconverter. Fujifilm today announced the long-rumored 35mm f/2 lens for the X-mount cameras, a small and light prime lens that functions as a normal lens for the X bodies. Article on sansmirror.com. Lens data page. Leica Makes Third Mirrorless Line. First we had the M, then the T, now we have the Leica SL (Type 601). This monster of a camera is a full frame version of the T, with EVF and lots of refinements. Article on sansmirror.com. Data page for Leica SL. Data page for 24-90mm f/2.8-4 lens. Sigma Continues Modernizing Lenses. Sigma’s latest Art lens is the US$900 20mm f/1.4 HSM, announced today and shipping in December. Article on dslrbodies.com. 20mm f/1.4 data page. Zeiss Continues Modernizing Lenses. Zeiss continued their onslaught of revised and modernized lenses by announcing the Otus 28mm f/1.4. Article on dslrbodies.com. 28mm f/1.4 lens data page. Zeiss Adds Third Loxia Lens: 21mm. Zeiss today introduced a third Loxia lens for the Sony FE-mount, the Loxia 21mm f/2.8. This modest-sized manual-focus lens is a Distagon-type design and will sell for US$1499. Article on sansmirror.com. Loxia 21mm data page. Canon Burrows Deeper Into the Mud. What to make of the EOS M10 camera announced today? To my eye it looks like and specs out mostly as a slightly reworked and simplified EOS M2, which never made it to the US. Article on sansmirror.com. EOS M10 data page. 15-45mm f/3.5-6.3 data page.